On my recent April 1st trip to Moldova, I saw the Father. The Father did not appear riding upon the clouds or in any spectacular burst of light. 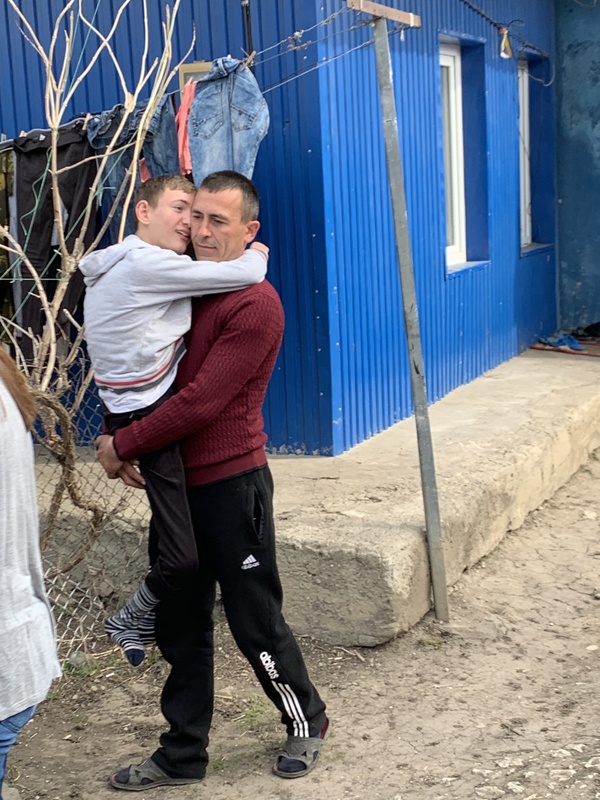 In fact, He was found in a simple peasant’s home in a village like most others in Moldova. 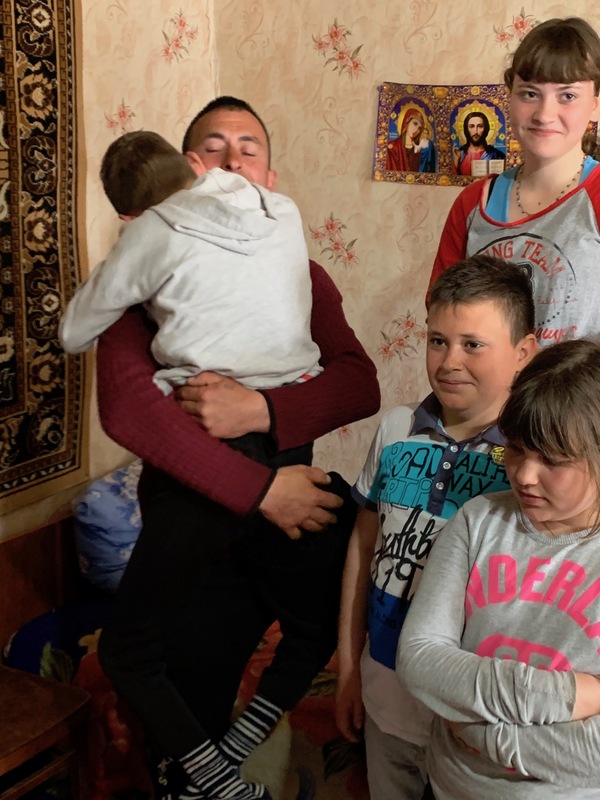 Our little mission team of eight had gone there to deliver food and necessities to the family of a 15-year-old boy named Marius. Marius has cerebral palsy, or something similar. When we ducked into his family’s two-room home, he was being supported in his father’s lap. In response, he made a valiant effort to put his right arm around his father’s neck. With his father’s assistance to do so, he snuggled contentedly into his father’s neck, raising his head enough to look him in the eyes and then kiss him several times. And that was when I knew we were in the presence of The Father….Father God! Short of Jesus, there is no better image I can think of. We are broken people. Our wealth and good fortune almost completely mask that fact. In prosperity and health, we forget our vulnerability. We vainly imagine we are self-made (just as the Soviet era statues of men and women in Moldova’s cities and towns mistakenly profess with their characteristically strong, oversized hands). Inevitably, life (or providence) will remind us of just how truly dependent we are. When that day dawns, whether by catastrophic loss, irreparable injury, debilitating disease, or old age, all too often we will blame God for our misfortune. Why? Because we have trusted too long in our own strength and ingenuity rather than His. We did not acknowledge it was His arms that held us upright. We did not find reason to bathe ourselves in His smile. We failed in our lives to kiss the face of God daily! Perhaps this is why Jesus pronounced “the poor in spirit” blessed. Marius will never make our tragic and fatal mistake. He knows he is broken. He knows he is dependent. He knows he has a good, good father. A father he can count on for his every need. In retrospect, I wish I had thought to write down the name of Marius’ father. Maybe it’s just as well he remain nameless here. I think maybe God prefers to be found in anonymous faces and unexpected places. I think maybe He prefers to speak to us more through what is least than what is greatest. That way, we don’t relegate ourselves to just reading His story. We step into His story. That first step doesn’t have to be a giant one. Your legs may feel as weak as Marius’ are contemplating a trip to places as remote and seemingly intimidating as Moldova or the Amazon. That’s okay. Your Father will support you. It’s all a part of how we learn to walk humbly with our God!